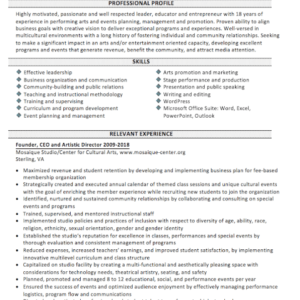 Resume posted by Katayoun in Arts and Culture. Highly motivated, passionate and well respected leader, educator and entrepreneur with 18 years of experience in performing arts and events planning, management and promotion. Proven ability to align business goals with creative vision to deliver exceptional programs and experiences. Well-versed in multicultural environments with a long history of fostering individual and community relationships. Seeking to make a significant impact in an arts and/or entertainment oriented capacity, developing excellent programs and events that generate revenue, benefit the community, and attract media attention.